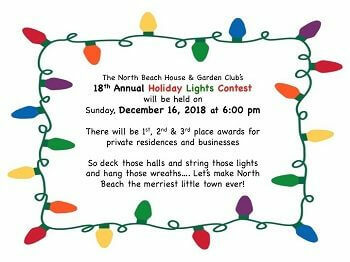 The North Beach House & Garden Club’s 18th Annual Holiday Lights Contest will be held on Sunday, December 16, 2018 at 6:00 pm. There will be 1st, 2nd and 3rd place awards for private residences and businesses. So, deck those halls and string those lights and hang those wreaths. Let’s make North Beach the merriest little town ever!